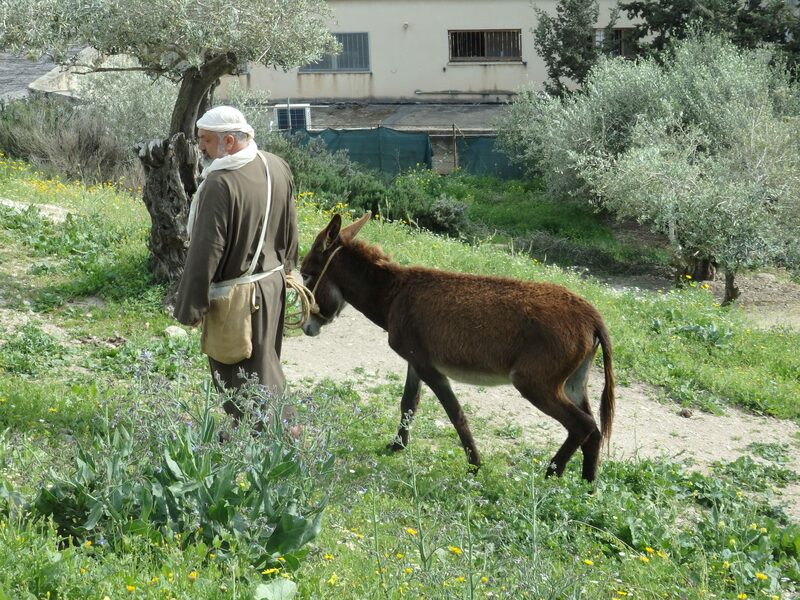 In biblical Nazareth, a man, dressed like an extra from The Ten Commandments, wanders slowly by between the gnarled olive trees, leading a donkey by a rope. He lingers for a while near our assembled group. The camera-toting tourists, dressed in shorts and tank tops, crowd around. The effect of being in biblical Nazareth is ruined: it’s hard to ignore the tourists, or the large modern buildings that overlook the site. This is Nazareth Village, and the idea is to experience life in the biblical Nazareth of Jesus’s youth. Small stone buildings dot the terraced landscape among the olive trees: craft workshops, houses, a synagogue. The olive grove, with modern apartment buildings overlooking the site. The site of Nazareth Village, on the edge of town in Jesus’s time, has been excavated by archaeologists. 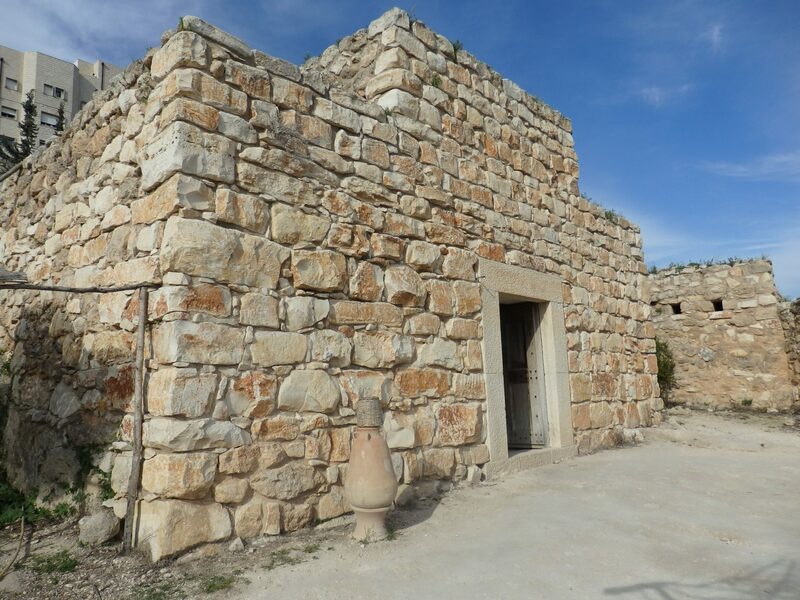 They found the remains of terraces, which have been restored, a wine press, an olive press, and other evidence that this land was indeed used as a farm. I shouldn’t have been surprised, but Nazareth Village is very much aimed at Christians making a pilgrimage to Israel. 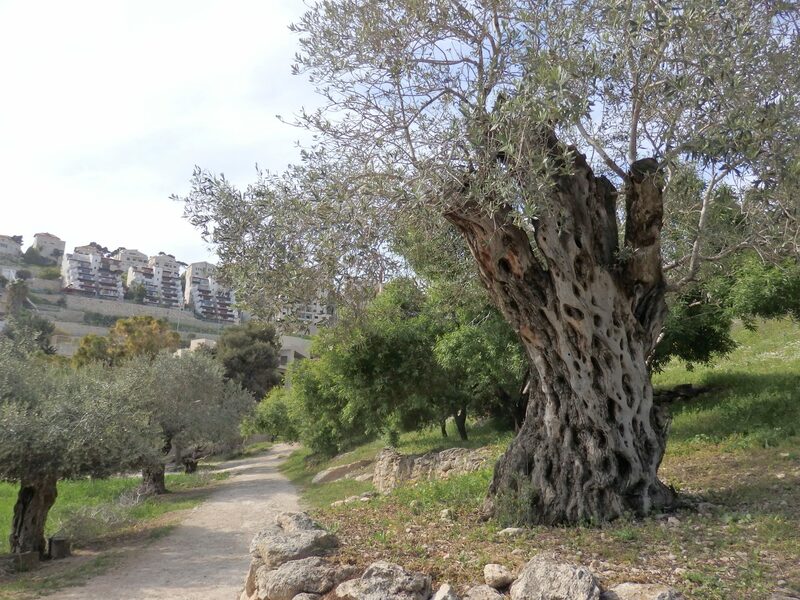 What that meant was that while the tour I took – you can only visit as part of a tour – did give information about biblical Nazareth, the emphasis was much more on Christian scripture than on archaeology. 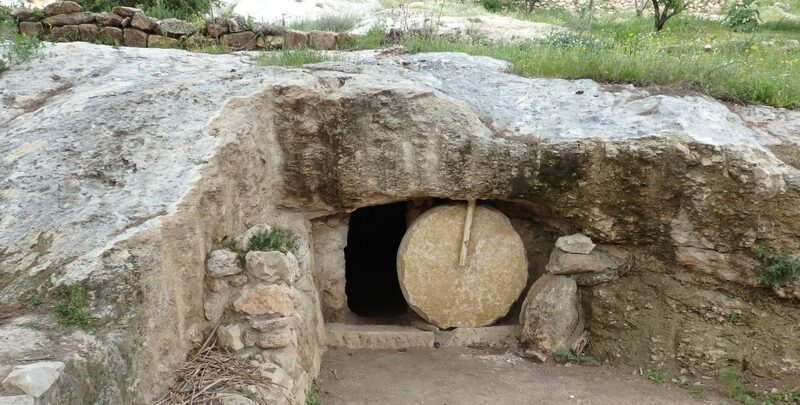 We saw, for example, a tomb, complete with a round stone that rolled back. We met “Joseph,” who was busy making tools in his carpentry workshop. A woman demonstrated first-century spinning and weaving methods. We were allowed to peer into the small, dark, living spaces. The tomb at Nazareth Village. Our last stop, the “synagogue,” became very much a church after we filed in and sat down and a pastor pulled out a Bible and started preaching. When he started talking about what would happen to some “sinners” who had not “yet” recognized Jesus as their savior – implying a condemnation of most of the population of the country we were visiting, Israel – I had to leave. I hadn’t realized that most of the other tourists in the group were American evangelicals on a pilgrimage together. 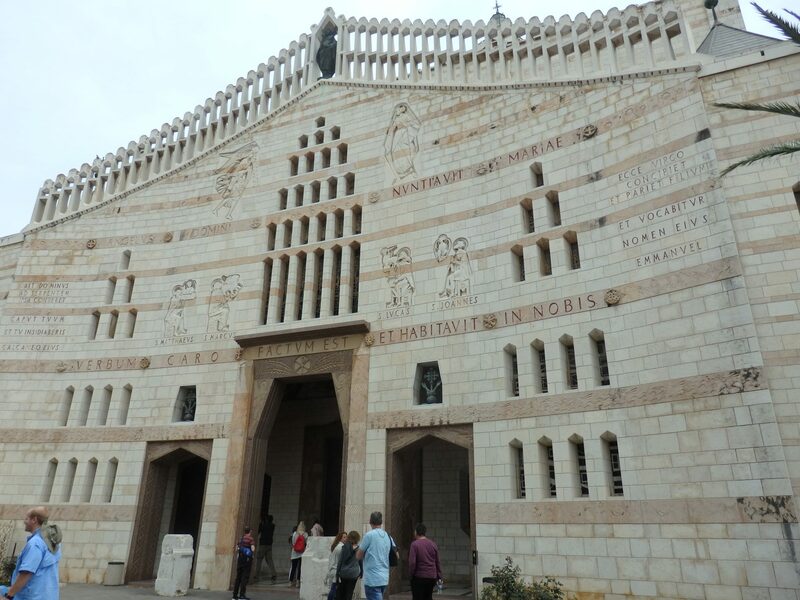 At a cost of about 12 euros, I think this tourist attraction is only worth visiting if you are a devout Christian and want a more direct feeling of connection to Jesus than the churches in Nazareth will provide. I suspect you’ll feel it much more deeply in Jerusalem, at the Church of the Holy Sepulchre, than here. For the rest of us, it’s probably not worth the time or trouble. The Basilica of the Annunciation is where Christians believe that Gabriel told Mary that she would give birth to Jesus. Dating only to 1969, inside you can see remnants of earlier Byzantine and Crusader-era churches. The interior architecture gives a much heavier, even oppressive, feeling, than the exterior led me to expect. The Church of St. Joseph stands on the site of either Joseph’s carpentry workshop or his home. Again, it is a 20th-century construction over the remains of earlier churches. 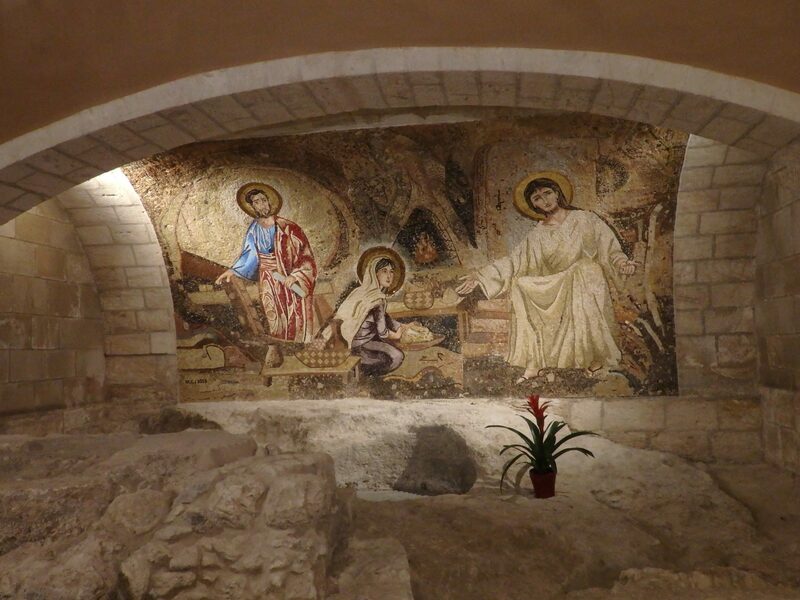 This mosaic adorns a wall in the basement of the Church of St. Joseph, above the spot where Joseph’s shop or home stood. The Synagogue Church marks the spot where Christians believe Jesus preached. It dates to somewhere in the Middle Ages. The Synagogue Church. Somehow the white plastic chairs ruin the solemnity of the place, don’t they? 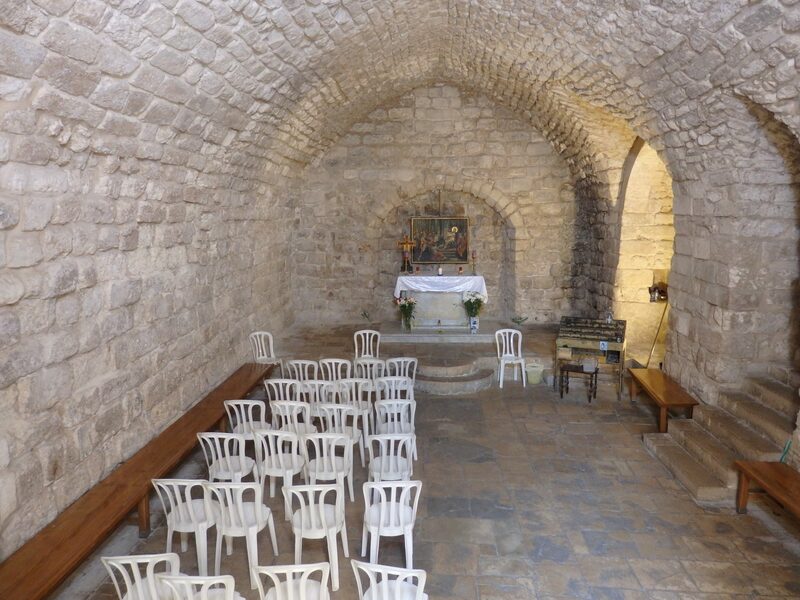 The 19th-century Church of Mensa Christi is built on a stone where Christians say Jesus ate a meal with his disciples after his resurrection. 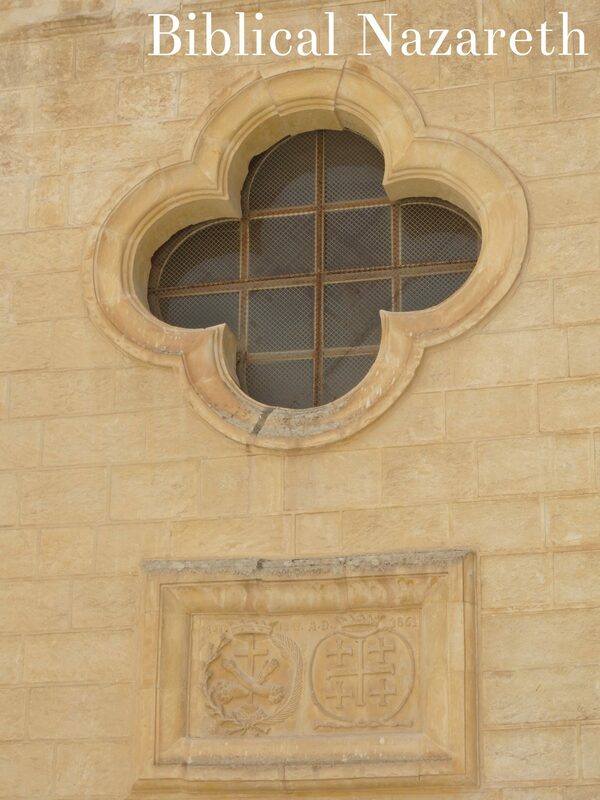 A detail of the facade of the Church of Mensa Christi: a pinnable image! Despite my lack of enthusiasm for Nazareth Village, I did enjoy spending a few hours strolling from church to church in Nazareth, exploring the narrow alleys of the old city. 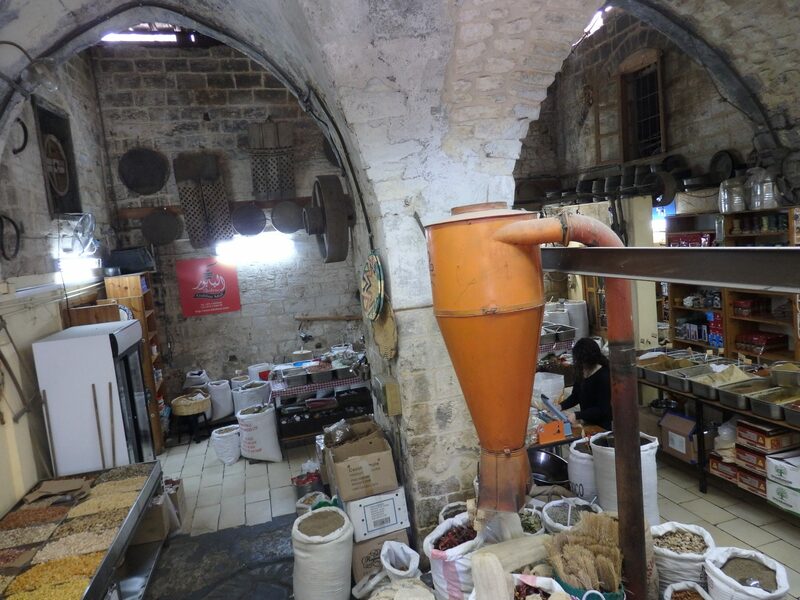 My favorite stop was something I came upon completely by accident: a spice mill and shop called Elbabour. Stepping inside, through a tiny door which forced me to stoop, I was entranced by the look and smell of the place: a mixture of spices I could never identify. The view as you step over the threshold into Elbabour. 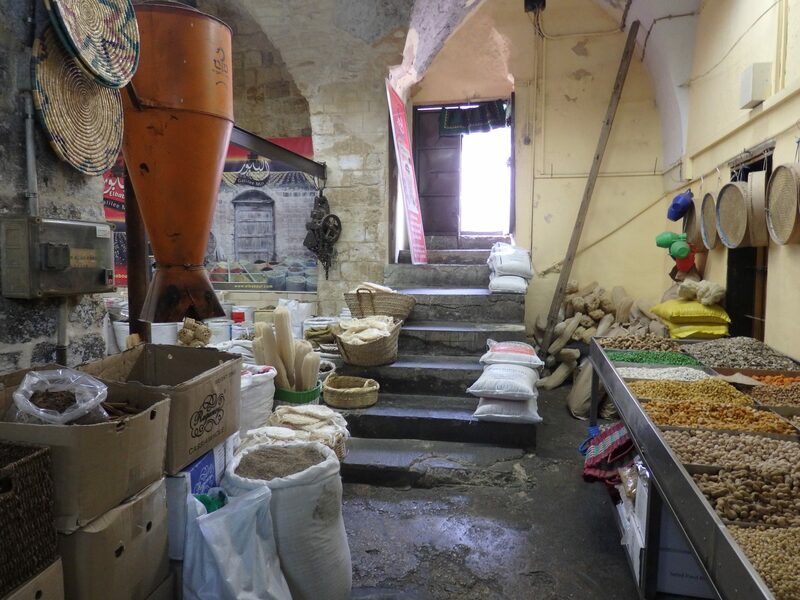 Bins and bags of spices, beans, nuts, and candies filled the partly underground room. Passing through the shop area, I could visit both the old mill room for grinding spices and some of the newer machines outdoors. Elbabour mill has been in operation for 120 years, milling spices on the premises. It has such atmosphere, I didn’t want to leave. I ended up wandering around, smelling the spices, and, yes, buying a few items. While this mill is much newer, it represents the kind of real, living history that neither Nazareth Village nor the churches of Nazareth represent. That may be enough to make Nazareth worth at least a brief stop. Looking back toward the entrance to Elbabour. There’s another entrance on a different street into a more traditional storefront. Haha! Then you’ll be joining me! That sort of sums up our experiences in visiting Jerusalem and Bethlehem as part of tours. A group member was invited to read a passage from the Bible at one stop and in the cubbyhole of a space near the Manger in Bethlehem the tour leader asked if the group wanted to sing a song! And yes, it turned out a member of the group — cruise tour, not Christian pilgrimage — asked to sing “Oh Little Town of Bethlehem” . . .that was it! We were outta there. Still not sure I have a desire to return. OMG, that’s hilarious! Even if you’re not religious, I’d highly recommend visiting Jerusalem and Bethlehem. Nazareth not so much. To be fair, the bible-thumping sermonizer was a visitor, not someone employed by Nazareth Village. But the arrogance of launching into a sermon when the whole group wasn’t from his church? Astounding! Too bad no one called him out on his proselytizing. I tend to avoid confrontation like the plague, so I just walked out. Traveling through Israel was a great experience but I found a lot of the tours had a mixed bag of biblical, secular, tradition and other elements in it. In reality, the Crusades destroyed what might have been actually historical/biblical sites by building ornate churches in what “may” have been religious sites and that’s where Christians go, thinking they are at a pinpointed site, when they may actually just be in the area. Still, it’s an amazing place to visit with so much history behind it. Yes, that’s absolutely true: most of the sites were “designated” in the Middle Ages. Nevertheless, they’re interesting BECAUSE they’re considered so central to the story; it’s historically significant because the people who came later made it so. Great story. I would tend to agree with you. I would like to visit the “real” city. Not a scene recreated by actors and very religious people. The lives of the people living there now would be much more interesting. Fortunately, Nazareth Village is near the center of modern-day Nazareth, so it’s easy to do both. The thing is: neither is “real”. Most Christian sites in Israel are just guesses as to where particular biblical events happened. And in many cases the guess happened centuries later, when the Crusaders arrived.